Our Trim Kote plastic trim restorer makes plastic trim look brand new again. Door handles, mirror casings, wheel flairs, bumper trim, running board inserts, faded bed liners, even golf cart trim, virtually anything plastic on the exterior of a vehicle can be restored to like-new condition. Watch our Trim Kote Video so you can see how to apply this product and how well it works! Used car dealers have begged to have a product that will renew ugly, faded door handles to like-new condition. Dressings wear off quickly. Trim Kote is a dye that will not streak or run off onto the paint. Our Trim Kote Plastic Restorer does not contain any silicone’s and will not dull out like dressings do. 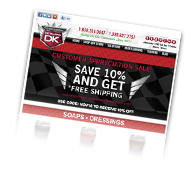 Our Plastic Trim Restorer Business Opportunity kit comes with two 16 ounce bottles of Trim Kote (1 Black/1 Gray). Each bottle is enough to restore up to 200 door handles, and both are popular colors. You will also receive a storage cart that you can use as a stool to sit on while restoring the door handles. However, its main purpose is to hold the included supplies. The storage cart can be easily wheeled around a used car lot or detailing bay. Also, included are two rolls of shop towels, two rolls of painter’s safe release tape, 100 nitrile gloves, complete instructions, sales and marketing ideas and on-going support. 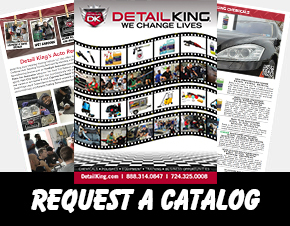 Click here to view Detail King Trim Restorer products! 1. What is a plastic trim restorer product like our Trim Kote? Trim Kote is a dye and is a permanent solution designed to restore exterior car plastic and vinyl surfaces back to their original luster. 2. What kinds of exterior car trim parts will Trim Kote restore? Bumpers, mirrors, fender flares, bed liners, splash guards, door handles, cowl vents, soft tops, windshield wiper arms, and even tires! 3. Does Trim Kote contain silicones? Trim Kote is 100% silicone free! 4. How long does it last once applied? Trim Kote is a permanent dye that will bring exterior plastic trim back to a like-new appearance. Usually, one coat of Trim Kote will leave your plastics and vinyl looking great for years. 5. Do I need any special equipment to apply it? There are a few ways to apply Trim Kote, but the easiest way is to use nitrile gloves and a 3” x 3” shop rag or mini roll-on sponge applicator. 6. Can I apply Trim Kote over any color of plastic or vinyl? For best results apply Trim Kote to either black or gray plastic or vinyl surfaces. 7. Will Trim Kote stain the paint or glass? Trim Kote only adheres to porous materials so it can be easily wiped off painted surfaces or glass. If you miss a spot and it dries, simply use a shop towel to rub it off. 8. How long does it take Trim Kote to dry? In warm weather it should dry in five to 10 minutes. Cooler temperatures may take up to 20 minutes. Do not use Trim Kote in extremely hot weather because it will dry too fast and could cause you to rush the application process. Try to find shade or an auto bay. 9. Will Trim Kote when it’s dry? Since Trim Kote has no silicone it will dry with a mat finish. However, you can apply just about any of Detail King’s dressing over top of Trim Kote after it has dried. 10. Can Trim Kote be applied to car interior components? Trim Kote is great for applying to exterior car trim and should not be used on car interior components.